We’d love your help. 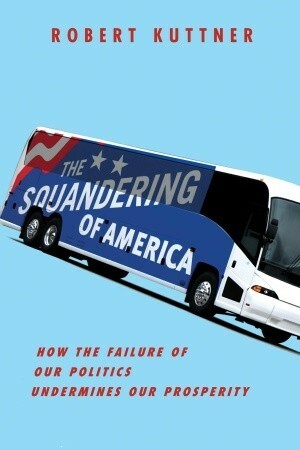 Let us know what’s wrong with this preview of The Squandering of America by Robert Kuttner. The incomes of most Americans today are static or declining. Tens of millions of workers are newly vulnerable to layoffs and outsourcing. Health care and retirement burdens are increasingly being shifted from employers to individuals. Two-income families find they are working longer hours for lower wages, with decreased social support. As wealth has become more concentrate The incomes of most Americans today are static or declining. Tens of millions of workers are newly vulnerable to layoffs and outsourcing. Health care and retirement burdens are increasingly being shifted from employers to individuals. Two-income families find they are working longer hours for lower wages, with decreased social support. As wealth has become more concentrated, the economy has become more recklessly speculative, jeopardizing not only the prospects of ordinary Americans, but the solvency of the entire system. What links these trends, writes Robert Kuttner in this provocative, engaging, and necessary book, is the consolidation of political and economic power by a narrow elite, who blocks the ability of government to restore broad prosperity to the majority of citizens. Kuttner—one of our most lucid economic critics—explores the roots of these problems and outlines a persuasive, bold alternative. In BusinessWeek, The Boston Globe, and The American Prospect, he has established himself as a prophetic voice connecting economics and politics. Here he demonstrates how our economy has fallen hostage to a casino of financial speculation, creating instability as well as inequality. He debunks alarmist claims about supposed economic hazards, such as Social Security and Medicare, and exposes the genuine dangers: hedge funds and private equity run amok, sub-prime lenders, Wall Street middlemen, and America’s dependence on foreign central banks. He describes how globalization of commerce has been used by business less to promote free trade than to escape the balanced regulation that delivered widespread abundance in the decades after World War II. While our financial security has weakened under President George W. Bush, Kuttner also faults many Democrats for failing to offer compelling alternatives. Now, with financial markets in crisis and public opinion supporting a more active role for government, he offers a new model of managed capitalism that can deliver security and opportunity, and rekindle democracy as a check on concentrated wealth. To ask other readers questions about The Squandering of America, please sign up. "As wealth has become more concentrated, the economy has become more recklessly speculative, jeopardizing not only the prospects of ordinary Americans, but the solvency of the entire system". This is an extrodinary book about the why america need to take back a system that that is out of control. A must read! But the most interesting point from this book is about the expression that used by Kuttner.. Well, he even don't write about decreasing in US (or another 'weak' point), but he CAN wrapped all his argument in this book and maybe should be considerated in the future by 'our' people...? Good insight into the impact of tax cuts, New Deal, trade, economic rise of Asia and the politics. Unfortunately redundant and could have been written as a 20 page essay that highlights the main points. However, 300 pages does give opportunity to hammer the points home. Recommends it for: anyone who wants to understand why the US is in a pickle! Sums up all the horrors since the Reagan presidency (and even before in the author's analysis) that led us to this current shellgame of an economy. Kuttner explains it all clearly for those of us who are not economists. His lively writing style makes some of the depressing content more bearable! Disturbing prescient as to everything that's going on now. I got bored and didn't finish--the first chapter was really good though! "Read it, feel depressed, feel inspired, just read it!" a good companion to Krugman's "Conscience of a Liberal"